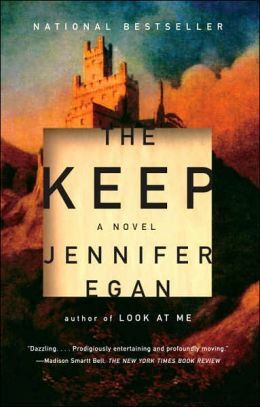 Only Maria Semple’s recommendation could get me to try reading Pulitzer Prize winner Jennifer Egan again – this time one of her earlier books, The Keep. Mixing elements of the Gothic romance, ghost mystery, fantasy, and thriller, The Keep was more satisfying than A Visit From the Goon Squad, which I have yet to finish. Egan manages to connect two unlikely plot lines with two cousins in a European castle and two prisoners in a creative writing class – while simultaneously commenting on dependence on electronics and the paranoia motivated by inner demons. The story opens with Danny traveling to his wealthy cousin Howard’s castle in an obscure location in Eastern Europe that is “off the grid.” Not being able to communicate with the outside world becomes an underlying theme that resolves itself in the last chapter, but the message is clear – cell phones and their counterparts have removed the ability to think imaginatively and to participate in the present. Egan dated Steve Jobs for a while – a possible influence? Howard’s castle is under major renovation with crew chief Mick, Howard’s childhood friend from reform school and now on parole under Howard’s supervision. Danny, happy to escape his miserable life, accepts the one-way ticket but worries that Howard may be planning revenge for Danny’s cruel and almost fatal prank when they were boys. An aging baroness, who has locked herself in the keep, the castle’s fortified tower, provides the catalyst for their confrontation. If you blink, you will miss the insertion in the first chapter that creates the grounding for the main plot line that follows. Ray, a prisoner, is writing a story about a man who finds an amazing castle, with a keep. Egan periodically interrupts Danny’s adventures with insertions of Ray’s life in prison, adding an attractive creative writing teacher who gets a crush on Ray and a prison roommate who thinks he has invented a “radio” that taps into the wavelengths of dead conversations. So, the story within the story – one feeding the other. Despite Egan’s underlying message that everyone is in danger of becoming a prisoner of their own making, the plot is riveting and kept me reading to finish the book in one sitting. The book ends – but then ends again – with an added chapter that has the creative writing teacher finding the real castle in the real world. Possibly it does exist somewhere, or maybe Egan only wishes it does. This entry was posted in authors, book review, books, fantasy, mysteries, places to go, reading, science fiction and tagged Eastern Europe, Egan, Jennifer Egan, Keep, Maria Semple, Pulitzer Prize, Steve Jobs, The Keep, Visit From the Goon Squad. Bookmark the permalink. Once again, you and I are in agreement. Had to force my way through Goon Squad for my book club. Did NOT see what the critical acclaim was all about! Never heard of The Keep, but your review has piqued my interest. Will check into it. I always find that a plot adds to my enjoyment of a work of fiction! LOL!